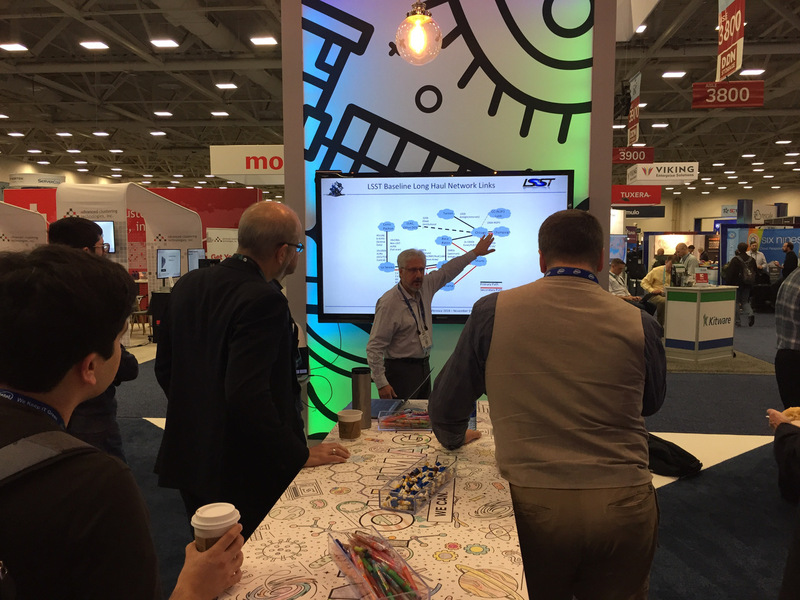 November 20, 2018 – The LSST Network Engineering Team (NET) had a strong presence at the Supercomputing 2018 Conference (SC18) in Dallas, TX, last week, including a successful demonstration of the data transfer capabilities of the fiber optic networks that will be used during LSST operations. Digital data were transferred from the Base Site in La Serena, Chile, to the LSST Data Facility at the National Center for Supercomputing Applications (NCSA) in Champaign, IL. During the data transfer demonstration, a peak rate of 100 Gigabits/second (Gb/s) was achieved for short periods, and a sustained rate of 80 Gb/s was achieved over a three hour period, exceeding the test target. This test was run over links provisioned by several networking organizations: REUNA from La Serena to Santiago, FIU/Amlight from Santiago to Miami, SCInet from Miami to Chicago (Starlight), and NCSA from Chicago to Champaign. SCInet links provided by CenturyLink and internet2 were used to transfer the data from Miami to Chicago because LSST 100 Gb/s links will not be available in that path until FY20. All of the other links were those that will be used by LSST during operations.